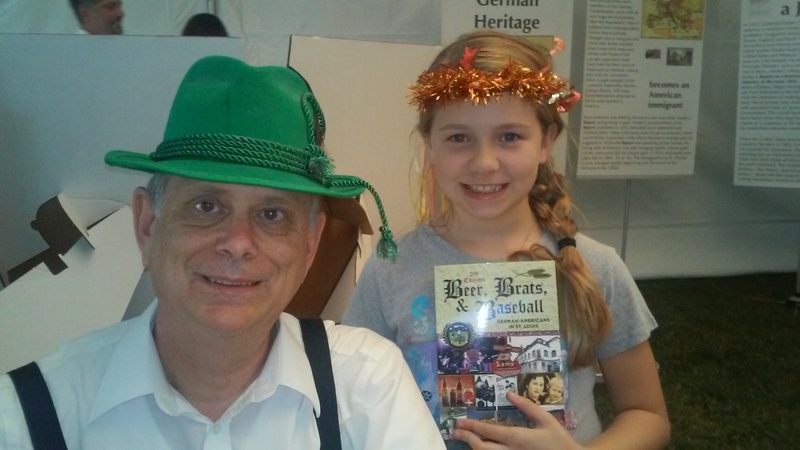 I had all kinds of fun signing books and hanging out in the German Cultural Tent of the family-friendly St. Charles Oktoberfest Saturday afternoon. But my biggest treat was 9-year-old Susanna King, shown behind me with a copy of the second edition of my book. 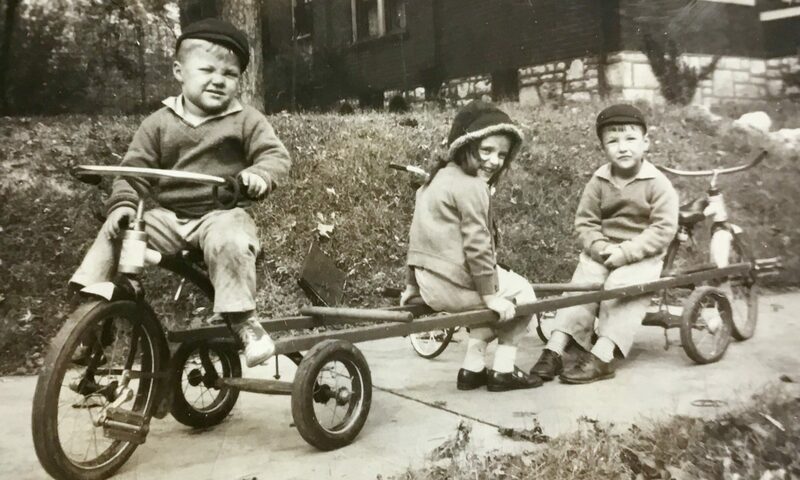 Beer, Brats, and Baseball: German-Americans in St. Louis. While I was talking to Susanna’s mom, Susanna picked up the book and started reading it. No, she stared at it and wouldn’t stop while we kept talking. Of course her mom, Olivia King, bought it for her daughter, who attends Blackhurst Elementary School in St. Charles. Let’s hope Susanna lets her mom read it when she’s done! 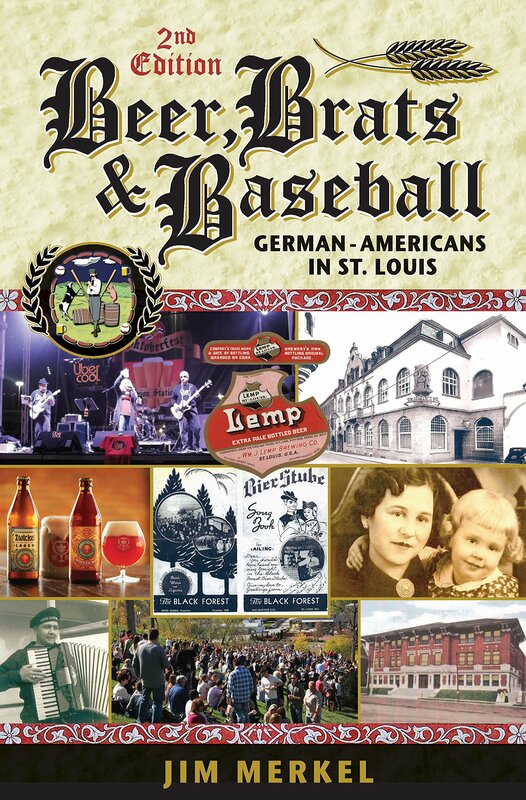 My 2012 book, Beer, Brats, and Baseball: St. Louis Germans was a stunning success, both among locals with a pinch or more of German blood in them and those around here who loved a good story. When the copies ran out, Reedy Press could have turned on the printing press to get more. Instead, we found new stories and updated the old, in a second edition called Beer, Brats, and Baseball: German-Americans in St. Louis. Here is a story of a German immigrant who retired to his homeland just before World War I, a local rock band that plays current-day German pop songs and a German who is continuing the German beer brewing tradition of St. Louis. The book is a must. I’ll be at two locations this weekend signing and selling the book for the first time. From 8 a.m. to noon Saturday, Sept. 12, I’ll sign at the Ferguson Farmers Market, 20 S. Florissant Road, Ferguson. Then I’ll hop into my lederhosen and sell from 5 p.m. to 11 p.m. Saturday, Sept. 12, and from noon to 6 p.m. Sunday, Sept. 13 at the German Cultural Society’s Oktoberfest at 5020 West Four Ridge Road, House Springs. You can also get a copy through Amazon or by sending a check for $21.50 made out to Jim Merkel made out to Jim Merkel, 4216 Osceola St., St. Louis. 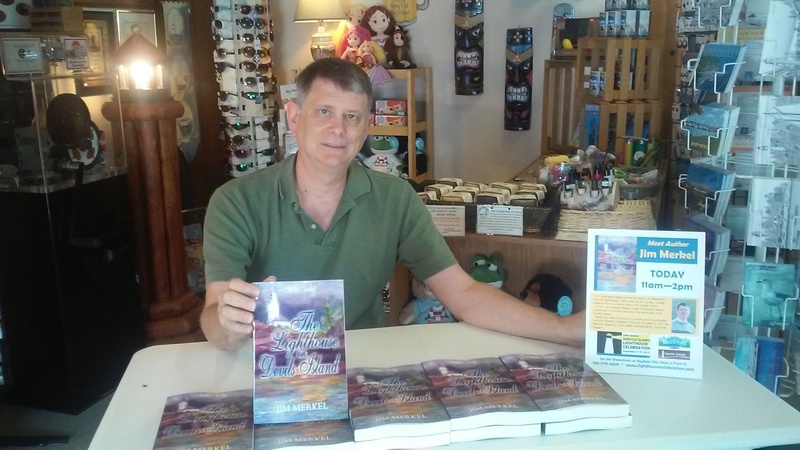 Last week my wife and I traveled to our favorite vacation place, Bayfield, Wisconsin, to enjoy the water and the cool breezes and to sell my novel, The Lighthouse on Devils Island. 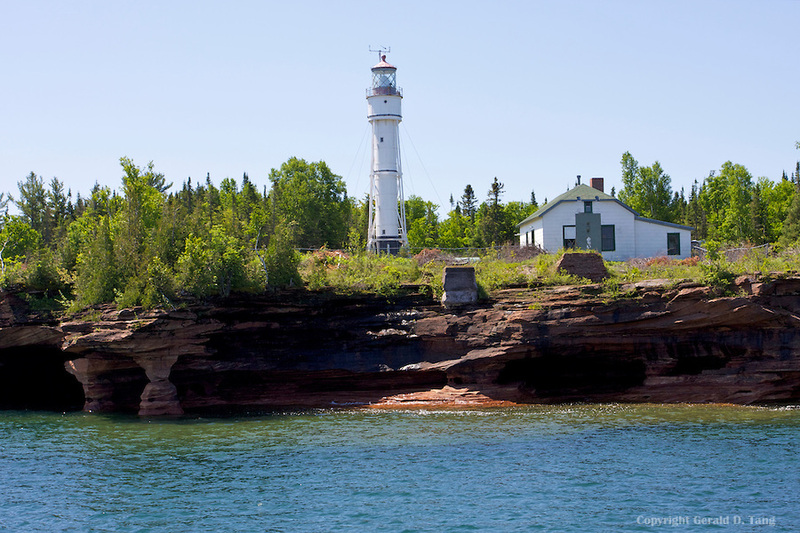 Set in 1928, the novel tells the story of the redemption of a bitter old lighthouse keeper who believes he’s wasted his life as keeper of the Devils Island Lighthouse in the Apostle Islands of Lake Superior. It’s a real place, and you get to it through Bayfield. And for those who can’t see a St. Louis connection, a family from St. Louis that comes to work on the island helps the keeper see he hasn’t wasted his life at a lighthouse. They come from Cherokee Street, actually. It was fun meeting potential buyers at three different readings and at signings at two other stores. In one, I read during a cruise to the Raspberry Island Lighthouse. Above I show off my books at the Keeper of the Light nautical book store in Bayfield. I loved hanging around with the owner, Mary Grant. 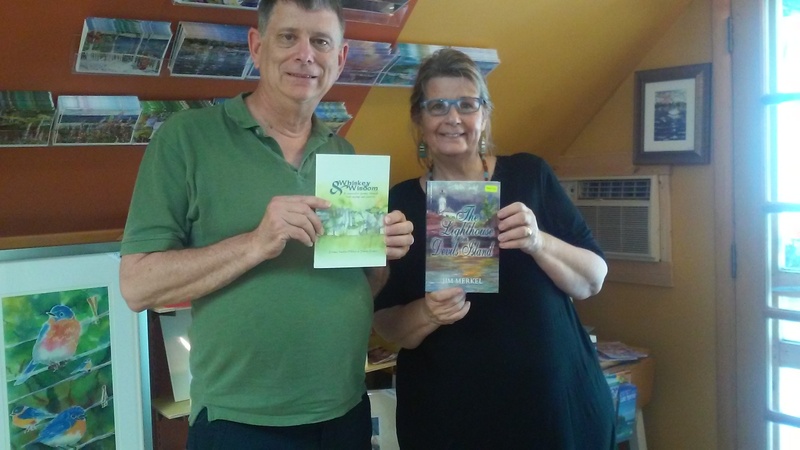 Also, as you see below, Lorraine and I dropped in on Austin Miller, the artist who allowed me to use her artwork of Devils Island on my front cover. I’m holding a book she produced. One more picture: the Devils Island Lighthouse. The book is available through Amazon. You can also get an autographed copy mailed to you by sending a check for $17.25 made out to Jim Merkel to Jim Merkel, 4216 Osceola St., St. Louis, Mo. 63116.